You Are Running Out of Time, Fruit Vendor. A Bethesda Fruit Stand just off the highway was ordered to move its location or face sanction and they’ve decided to stand pat. Country Thyme sets up on River Road, which can be a fairly busy place to try to do commerce in the middle of the rush. They’re working on moving to a church lot, but haven’t yet completed the deal, which means they’re right where they always are. Of course, that hasn’t stopped SHA officials from showing up, and crushing their apples. We Love DC apologizes for anyone who doesn’t get the nerdy, nerdy jokes in this article. We have a problem, we’re seeking help. FRUIT VENDOR!!! Your cart is still in our way! We will give you one more hour to move it from our area. Do not test our patience anymore! 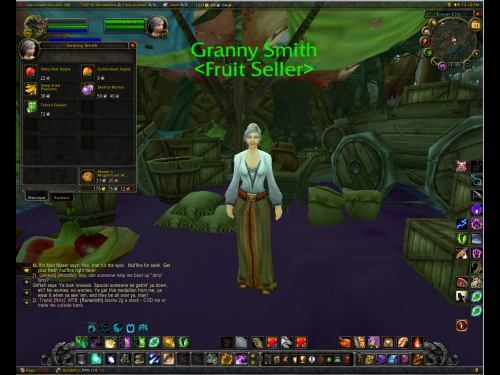 Fruit vendors never give me a good enough return on unusable, grey axes that mages can’t even use. Occasionally I go the the Fruit Vendor wishing they would vary their sales. I mean how hard would it be to sell some Ironbark seeds or some Draenei Water?